Here you will find a set of example figures with the code that generated them. 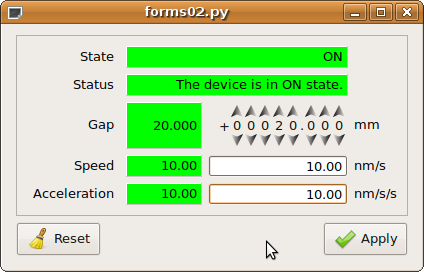 In order for the examples to work on your computer, you need to have a Tango device server running. The following section explains how to do this. 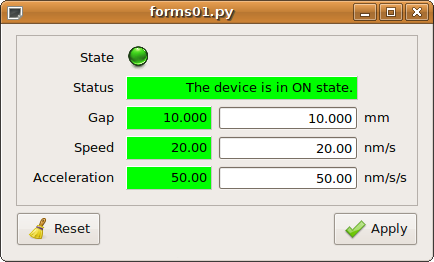 The device server used for the examples can be obtained here. You can easily configure it from Jive by going to Edit->Create server and type the above parameters in the dialog that pops up. You must prepend and append the above code in order for the examples to work properly. not much code to write, but... boring! And little bit more... add the units. Now it seems a little bit more useful, doesn’t it? Now let’s say you want to display not only one but a dozen attributes... the programming becomes quite tedious. Taurus provides a higher level of abstraction: the panel.TaurusForm. ...and don’t worry: panel.TaurusForm properly aligns the labels, manages the apply buttons and most important, it automagically decides which are the most appropriate widgets to use depending on the kind of attribute (you do not need to worry about whether the attribute is a scalar or a spectrum; or if it is read-only or writable; a boolean or a float, etc). I specially enjoyed this one... let’s see what’s next! TaurusForm is highly customizable. This example shows how you can change the default widget for some attributes according to the user needs. A little configuration goes a long way! Say you want to plot two SPECTRUM attributes and watch them changing on-line? Taurus provides a very complete widget: plot.TaurusPlot (which makes use of the PyQwt library) . In the former example each element of the spectrum attributes, was assigned its position index as the x-value (i.e., the “abscissas” attribute was plotted as a spectrum). But, what if you want to create a scatter plot where you want to read the x values from one attribute and the y-values from another? Solution: you use xValuesAttrName|yValuesAttrName as a member of the models list. Note that now the sys/taurustest/1/abscissas attribute is being used as x-values instead of being considered as another spectrum to plot like before. You are not limited to plotting data from Tango attributes. With plot.TaurusPlot you can also include arbitrary points (or even functions) in the plot. ...note the third curve: its definition is just a string defining a mathematical formula! Note: if you pass a model that is a Tango SPECTRUM attribute (instead of a scalar), TaurusTrend will interpret it as a collection of scalar values and will plot a separate trend line for each. For more details and tricks regarding TaurusGui, check this.